IT’S BEEN a hugely difficult and emotionally testing few weeks for Derry City physio, Michael Hegarty and his family following the recent and untimely death of his mother, Deirdre. After a relatively short illness, Deirdre, originally from Westland Avenue in the city passed away after losing her brave battle with cancer on July 23rd last. And while her son, Michael admits emotions are still raw and her death hasn’t yet ‘sunk in’, he believes his quick return to duty at Derry City Football Club has helped take his mind off the passing of a remarkable woman who had an immense impact on his life both on and off the football field. And he thanked Derry City and its supporters for an emotionally charged tribute paid to his mother at the recent Longford Town game at Brandywell Stadium. Prior to the kick-off the club staged a minutes’ applause for Mrs Hegarty which came as a shock but was warmly welcomed by Michael who was present in the Brandywell dugout. “It came as a bit of a shock,” said Michael. “Peter (Hutton) came to me before the game and asked me if it would be okay if the club staged a minute’s applause. The late Deirdre Hegarty pictured with her husband George. “On behalf of myself, my father George and the rest of the family I would like to thank the club for doing that. It was a really nice touch and a great send off for my mum. “She only passed away three weeks ago so definitely emotions were raw. It was a very short illness. She was diagnosed seven weeks before she died,” he explained. “She had been feeling a bit unwell for a few weeks, She lost a bit of weight and went to the doctor and they discovered she had a massive tumour in her liver. Obviously at that stage it was too late. We tried to get second opinions but there was nothing they could do for her,” he explained. The minute’s applause at Brandywell was a touching moment, definitely. It just shows you that at times like this, the power of sport and how people pull together. Deirdre and husband George, who has been heavily involved in junior football circles, have been two hugely respected figures in the local community and that was evident at the large turnout for Deirdre’s funeral. “The turn out at the wake and funeral just showed how well thought of she was. “We’ve had great support. The amount of people who have sent cards and have been there for my family has been great. “But the minute’s applause at Brandywell was a touching moment, definitely. It just shows you that at times like this, the power of sport and how people pull together. “Obviously through my own involvement in sport and being the Derry City physio and my dad’s, it’s been great to see so many people rally around and show their support. “We’re a close family and all live in Derry so everyone has been there for each other to try and help us get through it. With me being involved with the club and football it has been a good thing for me. Michael, who took the decision this season to hang up his boots at the age of 31 years-old, leaving Coleraine Football Club and a fantastic career in the Irish League behind, credited his mother for having a major influence on his career. “Without a shadow of a doubt she had a massive influence on my career. She would have taken me here, there and everywhere to matches and training when I was younger. “She would come and watch me play for Coleraine when we were at home and even some away games. Michael is currently in his second stint as Derry City physio having also served under Pat Fenlon in 2007. He found it difficult to balance playing for Coleraine and his commitment with Derry City given the amount of miles he was racking up last season. So while he made the difficult decision to prematurely end his playing career, he admitted he struggled with not being involved for the first time as Coleraine opened their Irish Premiership campaign against Glentoran at the weekend. And he admits he might yet change his mind, revealing he’s already had offers to return to the game. “Last year whenever Derry asked me to come on board I was still playing with Coleraine so I said I would give it a year and see how things went. “It turned into a bit of a mad year. There were times when Derry were playing on Friday night and we could have been in Dublin and then Coleraine were playing on the Saturday, maybe in Belfast. “And there was a couple of stages during the year when Derry played on the Monday night and Coleraine on the Tuesday so I was sometimes involved in four games in five days. “It was becoming seven days a week. 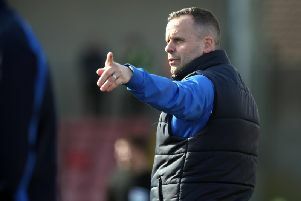 So I took the decision when Derry’s season started again in March, I spoke to Coleraine manager Oran Kearney and decided I would take a break. “So he let me go and to be honest this last few months I haven’t really missed it as I’ve been that busy. There’s only a couple of months left in Derry’s season so we’ll see what happens. “There has been one or two people sniffing about so we’ll see. It’s hard to give it up. I’m only 31 years old. So I think that decision is for another day,” he concluded.